I am back with a new post, I am sorry I have not put up a new post for nearly a week, and there was no post on Sunday, I didn't have time to write one as I have been spending time with family, during the Christmas weekend. However, i am back today, and today's post is going to be a "What I got for Christmas 2015", I did a poll on twitter, to see if you would like to see this and everyone who voted said yes, so that is why I am doing it. 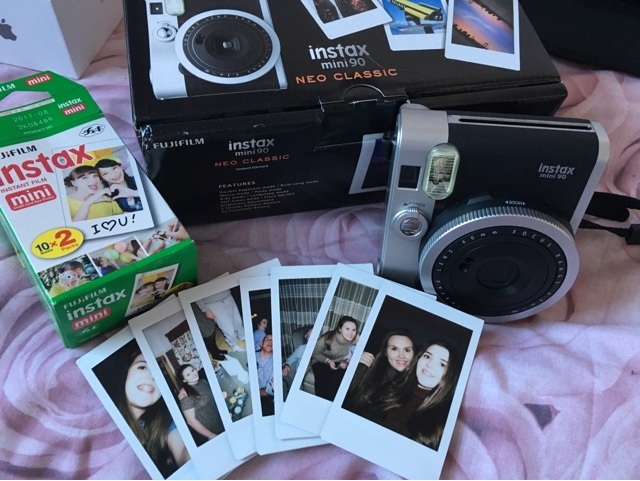 I am not trying to brag in anyway, I am so grateful for what I got this Christmas, and didn't expect all of this at all, so I hope you like today's post. Also, I am not going to go through everything, as I will be here for a while, though I do, have pictures of some of my presents I got. 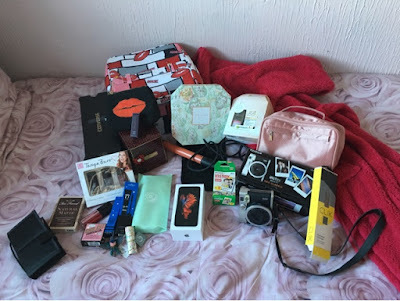 This is all the presents I got this Christmas, they varied from beauty items, cameras, phone and pjs. In this picture I am missing a few items, I received on Christmas eve off my Mum and Dad a pair of pjs, they had Minnie and Mickey Mouse on, and they were my Christmas eve pjs, however they are in the wash, if you want to see them, I posted a picture of me and my sister wearing them on my instagram (AilishElizabethx). I also got another pair of pjs on Christmas day, that are also in the wash, and they had Eeyore on. The bedding in the picture was also something I got on Christmas eve, it is my new Christmas eve bedding. Since I haven't done a single picture for all my presents, I am going to list some of them, so you know what they are in the picture. This is off my Grandad, and in the picture it looks more red, but in real life it is a dark hot pink, and it is so comfy and it so warm, I just love it and was so happy when I opened it. 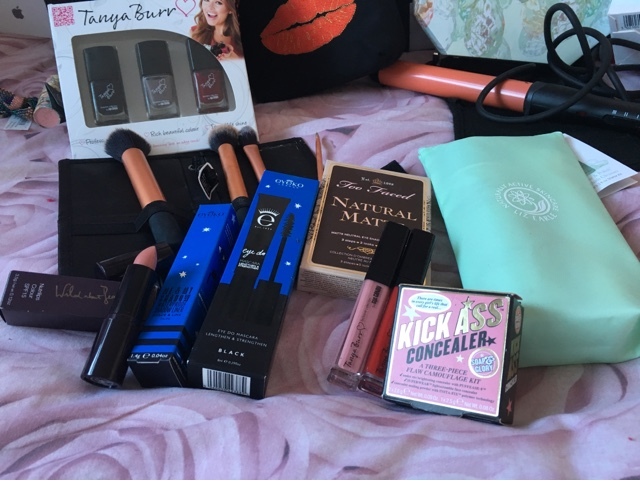 I got this off my Mum and Dad, and every year Soap&Glory come out this a Christmas set with ten full size products in, two of them are makeup items, I got one last year and loved it, so I was so happy to receive one this year too. This is another present I got off my Mum and Dad, I love this perfume, it is my favourite and if you read my blog a lot, you will know this and was running low on this perfume, so I was super happy to get a new one! I'm in love with this present, this is another present I got off my parents, as I have mentioned in previous post, I curl my hair most days, but I prefer nice loose curls, but can never do it with the wand I have, though this one is perfect, I used it on Christmas and Boxing day, and I love how it made my hair look. There are some of the presents I have not got single pictures for, now onto the ones I have got single pictures for. 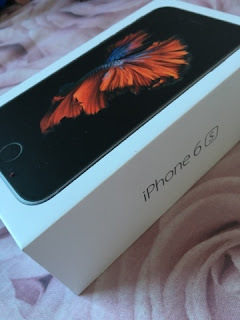 My main present this year was a new phone, and I got the iPhone 6s in space grey, and I love it. It is just such a nice phone. the camera quality is amazing and I love the force touch, it is just like the best thing in the world. Since I have a new phone, I was wondering if you would like to see a new What's on my iPhone post, as my old one is my most viewed post ever, if you do comment below or tweet me. To go with my phone I got a clear case, that is on my phone, and also a new portable charger, as my old one is not the best anymore. However, I have not used the portable charger yet as when I have been out, my phone has not died, because the battery life on this is so good. Another present I got was the Fujifilm Instax mini 90 Neo Classic, in black, this is most probably one of my favourite presents I got this Christmas. To go along with the camera I got two packs of 10 films, I have already went through a pack, so I think I will be purchasing a new pack soon. I loved taking pictures with this so far, the pictures look amazing, I actually have one on the back of my phone, as my phone case is clear, all the pictures I do have are of me and my family, as I used it a lot during the Christmas time. So the final presents I am going to go through are the makeup/beauty items I got this Christmas. I got this off my Mum and Dad and I have been using it non stop, this mascara is most probably the best mascara I have ever had. This is another makeup present off my parents, it is such a beautiful shade, it looks so nice on its own and with other eye shadows. I got a eye shadow palette of my Mum and Dad and the eye shadows in this are so nice, and they are all matte and I don't have that many matte eye shadows, if any and I have only used this about twice, so I can't wait to use it some more. These two lip glosses are so different, but so nice. I was not expecting to get these off my Mum and Dad, but love them and I can't wait to wear them more. Off my Mum and Dad I also got the Tanya Burr nail varnish set, with three nail varnishes in, they are in Penguin Chic, Midnight Sparkle and Riding Hood, I have wanted Penguin Chic for so long and I have it on now and it is so pretty! Another present off my Mum and Dad, and it is just so nice, it leaves skin feeling so soft and refreshed and hopefully some of my spots will start to go! I love this kit of brushes, I got it last year for Christmas off my Mum and Dad and it comes with four brushes, the buffing brush, the contour brush, pointed foundation brush and the detailer brush. I am so happy I got new ones off my Mum and Dad, as my ones from last year are stained with makeup, not matter how many times I wash them, they will clean a bit but not fully and they also aren't soft any more. I have wanted this for a while, but never bought it and I finally have it, I got it off my sister for Christmas and it is so good, I love it. I got this off my older cousin, along with a cute mini makeup bag from Emma Lomax. I hadn't heard of either companies, but both are amazing, the lipstick is so nice, the shade is so nice that I have and I am thinking of buying a new one! I hope you all liked this post, and I hope you all had a lovely Christmas, comment below something you got for Christmas! Also, thank you to everyone who got me a present this Christmas and I apologise if it isn't in this post, I am still thankful for them, but there was a lot to put in this post.